Price Canyon Trail #224 & Baker Canyon Trail #225 in the southern Chiricahuas are two of the few in the area that are accessible off a road other than the Rucker Canyon Road. Price Canyon Trail leads from the end of Price Canyon Road (FR 317) up a narrow sloping notch carved into the west shoulder of Sentinel Peak. From the turnaround at road's end, the trail proceeds up-canyon through riparian clumps of oak and ponderosa sprinkled with a few Arizona sycamore. About a half mile upstream, the Price Shake Trail #236 heads west up a side canyon. A mile upstream from the trailhead, at a series of seeps called Price Spring, there is an old dam and an exceptional stand of Arizona cypress, madrone and other desert canyon trees that have grown large and tall enough to cause most who pass this way to stop and take note. Their success at achieving heights not normally known for their species is due, no doubt, to the narrow configuration of the canyon here and the plentiful supply of water. Above Price Spring, the trail enters the Chiricahua Wilderness and continues to climb the canyon through more stands of cypress, ponderosa and Douglas-fir. 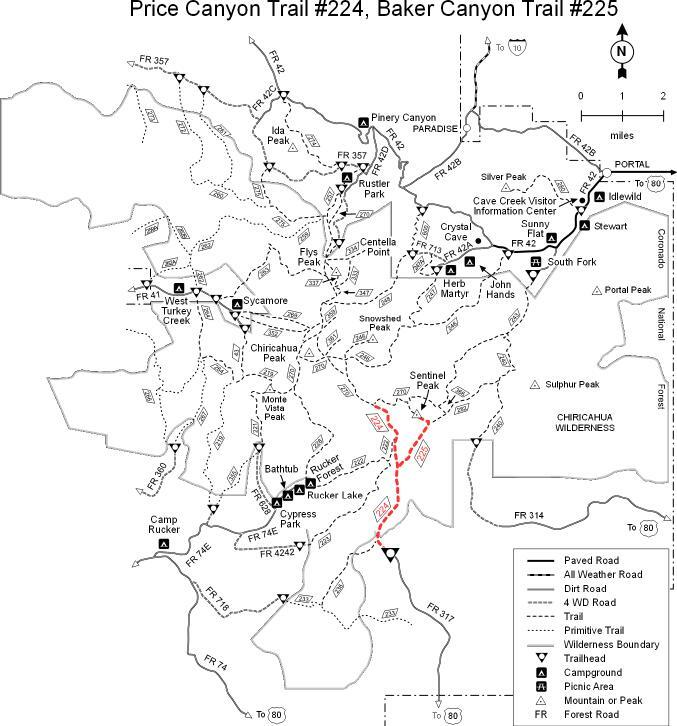 After passing both the Baker and Rucker Canyon trail junctions, the Price Canyon Trail leaves the canyon for which it is named to switchback 1,600 feet to the Crest Trail #270. From this junction, a turn east (right) on the Crest Trail takes you 2.1 miles to the 9,000 foot summit of Sentinel Peak. After visiting that high vantage point and enjoying its far reaching views, you can return to the Price Canyon Trail via the Baker Canyon Trail #225. This steep, rocky pathway staircases down Sentinel's south face, giving you a chance to enjoy those bragging size views a little longer before you drop into Baker Canyon and continue your trip back to Price Canyon and the trailhead. From Douglas, take US Highway 80 north 32 miles to FR 317. Turn left (west) and travel 11 miles to the end of the road and Trail #224. Trail #225 is accessible via Trail #224. HAZ needs updated information. It is unknown if this dirt road is car accessible.